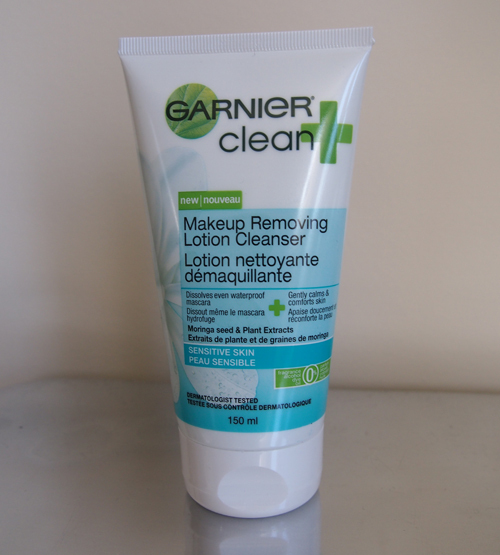 Clean+ Makeup Removing Lotion Cleanser is a new makeup remover from Garnier designed specifically for sensitive skin. The product is enriched with purifying moringa flower extract and contains no alcohol, dyes, or fragrance. The formula appears to be an interesting combination of cleansing oil (though it's not actually "oil" according to the packaging) and cleansing lotion which I haven't seen before. I would recommend lightly shaking the tube before use, otherwise the "oil" will seep out first when what you really want is to get a good mix of the two. You apply the cleanser to dry skin, massaging it to break down your makeup, and can either wipe it off with a cotton pad or rinse (I personally prefer to rinse). After use, my face was left feeling smooth and moisturized and I could see how this would be good for those people with sensitive skin types. Garnier also claims that the product "dissolves even waterproof mascara" and since that's all I wear, I was pleased to see that this was indeed the case. However, my eyes are extremely sensitive and I found the cleanser irritated them despite the fact that it's ophthalmologist-tested. Since stinging eyes are obviously something I want to avoid, I don't think this product is right for me. It's a shame since it does actually do what it claims! They also have a great charcoal scrub too in this line, it's great. I will defiantly have to check this out than, been having some problems with sensitive skin. This product sounds great !